Doddington Hall is situated in the Lincolnshire village of Doddington, about seven miles from the city of Lincoln. It was built between 1593 and 1600 by Robert Smythson, one of England’s most renowned architects. 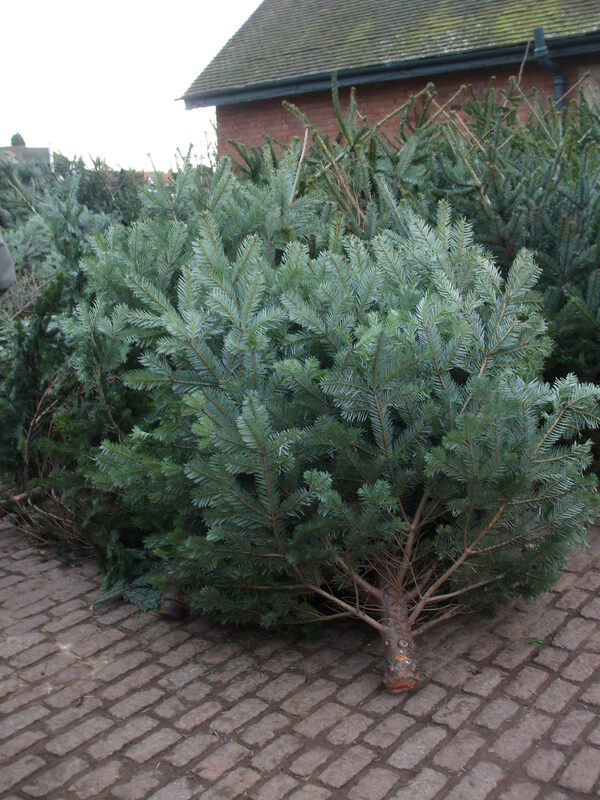 The Hall has a large estate on which Christmas trees are grown and a careful programme of planting/replanting is carried out. We have bought our tree from here for many years now. 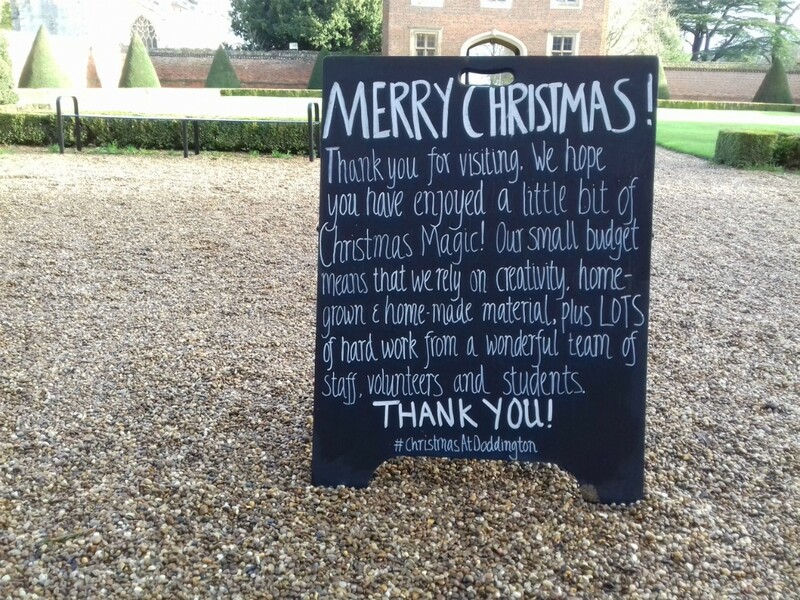 For the past six or seven years Doddington Hall has opened its doors for the Christmas season, this year from November 25 to December 23. 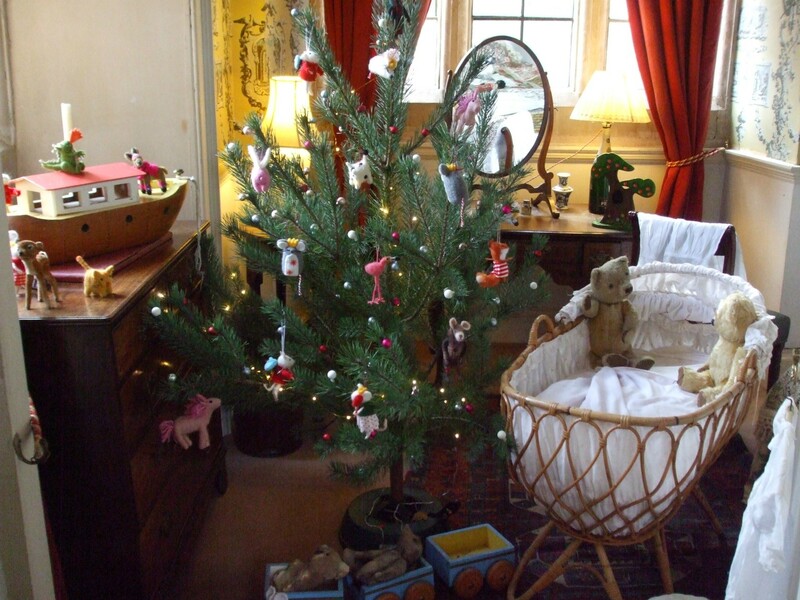 The rooms are decorated to a particular festive theme each year, this year ‘s being simply, Christmas at Doddington. Last year the theme was Christmas in Wonderland, which can be seen here and the previous year’s was A Fairytale Christmas, here. Both were a delight to see. 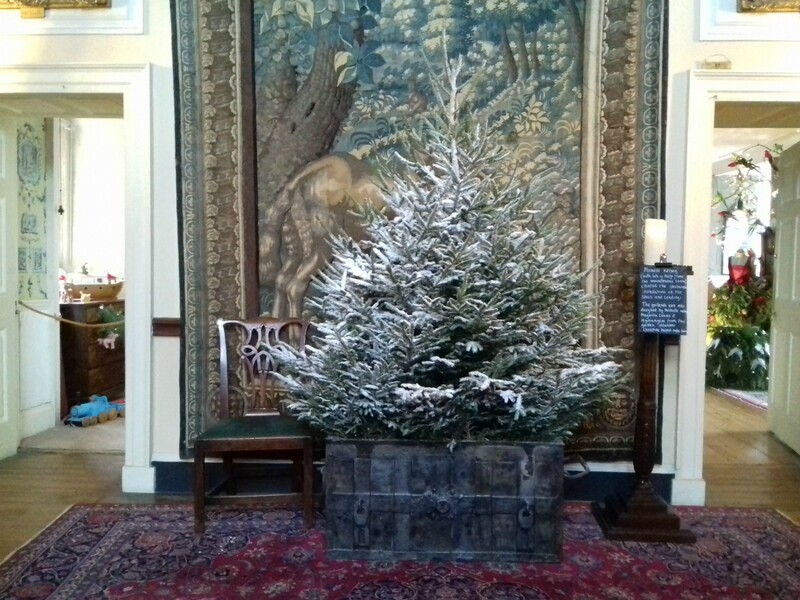 Christmas trees were first planted at Doddington 60 years ago and this year’s theme in is celebration of that, with decorations inspired by the carol O Christmas Tree. A great selection of Christmas trees adorn the rooms and hallways, all different in size and shape, and each decorated differently by using an incredible array of objects and materials. 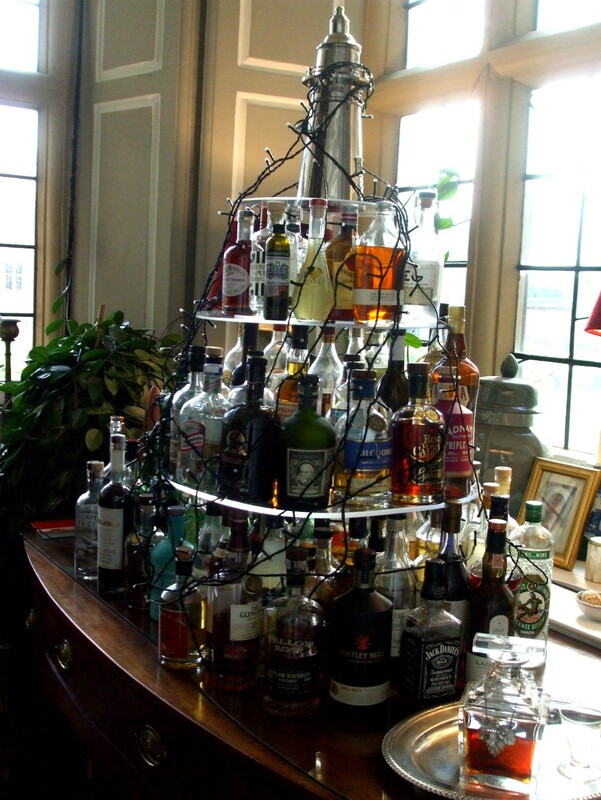 Some of the ‘trees’ are actual trees, others are created from either natural vegetation or seasonal/festive items such as drinking glasses and wine bottles. It’s all very colourful and in keeping with the Georgian ‘feel’ of the hall – the period in which Doddington was refurbished in the style it still looks today. And once through the front door, passing a tiny ‘tree’ decorated with good old Brussels Sprouts!. . .
Also on the ground floor was the parlour, an interesting room, in keeping with Victorian entertainments and parlour games, as played following the popularising of the Christmas tree by Prince Albert in 1840. 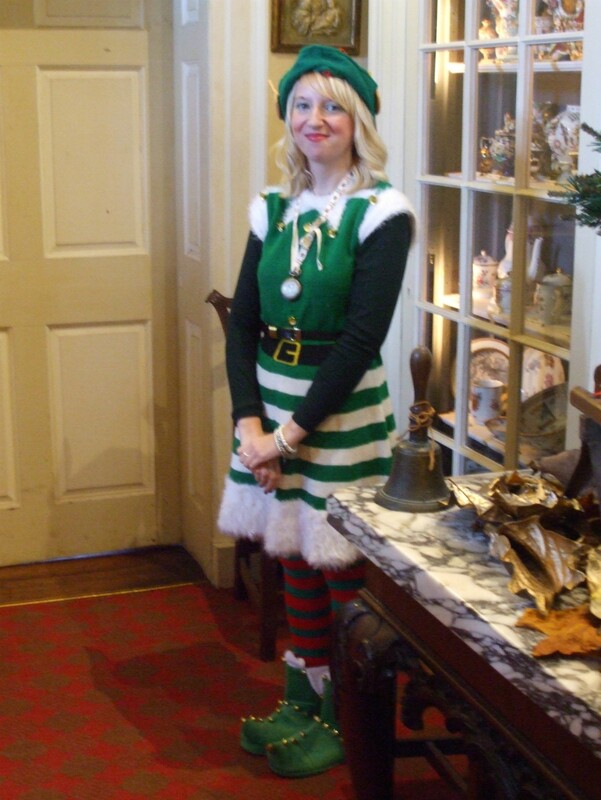 Waiting in the hallway at the bottom of the stairs was a very smiley and welcoming ‘Head Elf’. . .
. . . who we had a little chat with before heading up the impressive staircase. . . 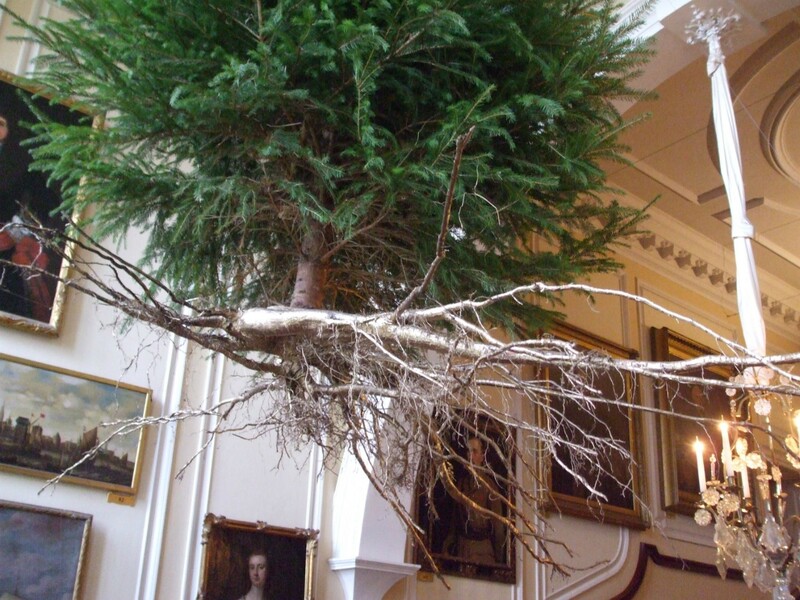 Eventually we got to the second/top floor, passing on the landing en-route a Christmas tree hanging from the ceiling to display its roots! The tent was made around 1880 in Cairo, where similar tents are still used today for weddings, festivals and fairs. It was given to Doddington by Viscount Harry Crookshank, who was MP for (nearby) Gainsborough for over 31 years, until 1961. He was born in Cairo, where his father was Surgeon General and the tent was part of his father’s ‘Eastern Curiosities’. Lastly is the largest upstairs room, This year it displayed models of a village and nearby railway on a Christmas Eve. 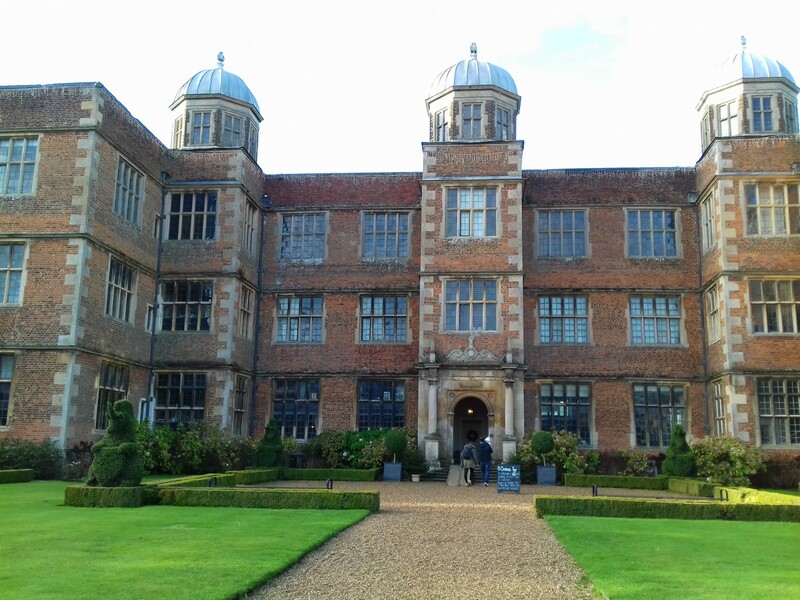 Doddington Hall at Christmas is a delight for people of all ages to soak up the historic, Christmassy atmosphere. At £11 per adult and £5.50 per child (under 3 years free and family entry £29) it isn’t particularly cheap. But for the time and energy that the staff put into these displays, it’s well worth a visit. 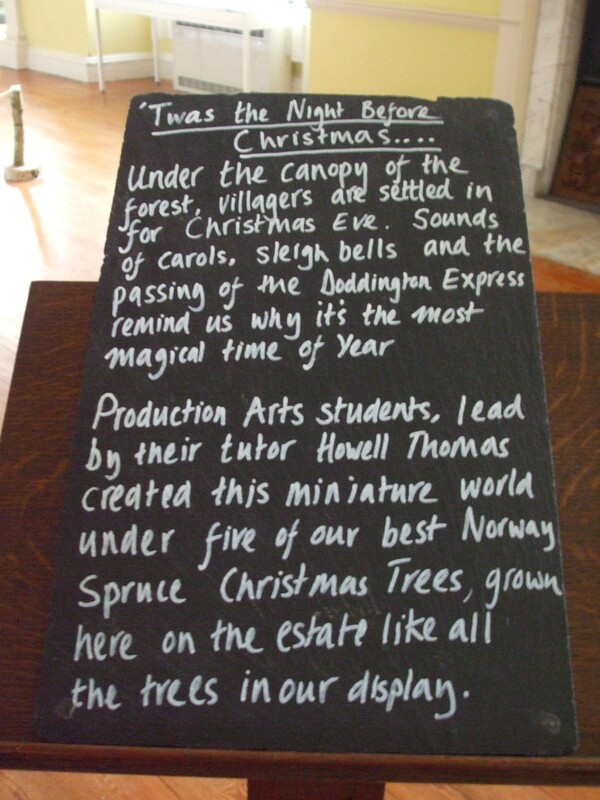 Bookings can also be made for children to visit Father Christmas in his grotto on certain days.